As June is the most popular month for weddings that is the theme for this week's Fairy Fun Fridays challenge. I am the hostess this week and strongly encourage you to enter this fortnight's challenge so that you have an opportunity to win some Prairie Fairy Designs images. I used the keyhole image from Vintage Lock and Key set on a heart-shaped card. I created the flower on top and added a key charm. 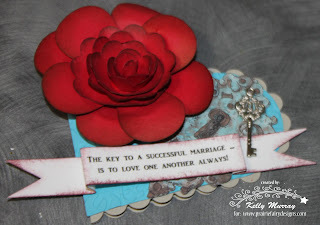 my goodness Kelly, this is gorgeous, I love the key with the sentiment and the flower is tdf! Adorable sentiment, beautiful card and amazing flower!! Beautiful colors and flower - great project. Thanks so much for playing at WHOOPSI DAISY and KABOODLE DOODLES this week!! Stunning Kelly. A beautiful flower atop a cute shape and perfectly placed sentiment banner! This is gorgeous! Thanks for joining us over at Sarah Hurley's! This is gorgeous, great hand made flower. Wonderful! Love the little keys and that beauitiful red bloom! Kelly your flower is amazing!